Ariana Grande has been offering support to her fans this week, in the wake of the first anniversary of the tragic Manchester bombing. Now, she's unveiled a permanent tribute to that UK city. 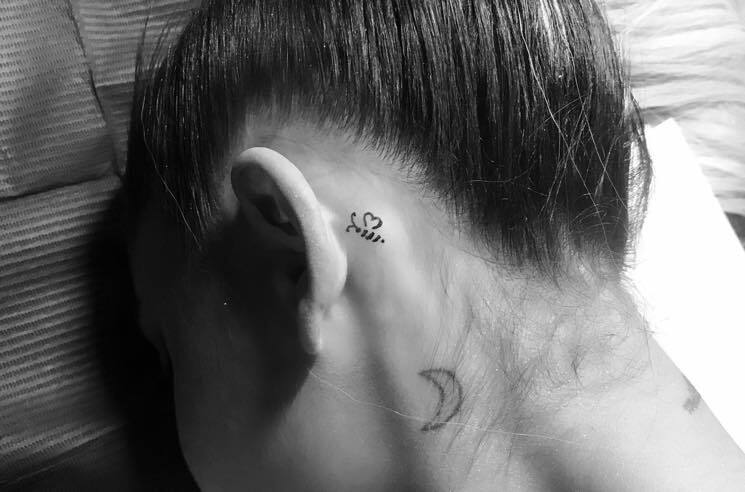 The "No Tears Left to Cry" singer shared a photo of her latest tattoo — a bee behind her left ear. The industrious buzzing bug has long been considered a civic symbol for the city of Manchester. The worker bee has been associated with the city since the Industrial Revolution, when factories were referred to as beehives and workers were likened to busy bees. It has been included in the city's official coat of arms since 1842. Since the terrorist attack last year, the bee has appeared in numerous tributes. Grande herself has frequently incorporated the bee emoji into her own commemorative messages. As previously reported, a suicide bomber attacked the Manchester Arena during Grande's concert on May 22 of last year, killing 22 people and leaving hundreds injured.